A member of the younger generation of Inhumans, San possesses slightly dog-like physical features, a series of tendrils protruding from the back of his head, and three fingered-clawed hands. He additionally has the ability to create sculptural objects from earthly substances and clay. San creates these sculptures via telepathy, channeling his emotions into artistic expressions. Prior to Terrigenesis, San had been an active and boisterous youngster. He loved to compete and fight and he dreamed of joining the Royal Guard when he was older. His father and grandfather were both highly decorated captains of the Royal Guard and San felt that it was his duty, privilege, and obligation to follow in their footsteps. And to this extent he was hugely dismayed to find that the transformation of Terrigenesis had rendered him diminutive, physically weak, and with powers quite ill suited for combat. San’s childhood friend, Alaris, had been bestowed great strength, size and durability via Terrigenesis and San watched solemnly as Alaris and other powerfully endowed Inhuman youths trained for the Royal Guard. Young San had a very hard time coming to terms with his fate and, though his father never said so, it was clear that he was disappointed over what his son had become. San found some degree of solace in discussions with his new friend, the Inhuman musician, Nallo. Nallo could create stirring music with harp-like stands that tethered from his shoulders to his forearm. He spoke to San about how the citizens of Attilan needed artists just as much as they needed warriors. At first San had a hard time understanding this idea. Late at night he went to the sculpture garden and channeled his feelings of frustrations into an elaborate crystalline sculpture; and was surprised the next morning when so many had gathered to view and laud this impressive work of art. Over time, San gradually came to accept his gifts and slowly let go of his resentment over not becoming the great warrior he had aspired to be. Later, San was summoned to be part of an emissary/student exchange program with the United States Government of Earth. Along with a group of fellow young Inhumans, San was sent to Madison Wisconsin where he attended classes at the local university. Although San was the least human-looking of the emissaries, he actually had an easy time adjusting to life among the humans. It was important for the humans to see that Inhumans could posses powers that created beauty as well as those more suited for combat. The emissary program was eventually dissolved and San was recalled back to Attilan. He returned to his art and continued to produce works for the Royal Garden. San’s current status and whereabouts following the fall of Attilan during the Infinity Event remains unrevealed. A latent Inhuman and citizen of the secret citadel of Utolan. Together with Ikelli, Sanara conspired against the Maternal Council of Elders as part of an effort to unset the council and resist any attempts to reform the cultural practices of Utolan. A skilled geneticist, Sanara collected organic samples from the outsider Inhumans, possibly as part of an effort to bolster the genetic composition of the populace of Utolan. When her plot failed, Sanara tried to flee Utolan and outrun the Terrigen Cloud as it neared. Ana Kravinoff prevented this escape and the cloud overtook both Sanara and Ana. Whether or not Sanara survived and how Terrigenesis may have altered her remains to be seen. An Inhuman whose body appeared to be made out of a gold-like alloy. What powers she may have possessed was never shown. Sapphiras had been a junior-ranking member of the genetic council during the time that Arcadius acted as the council’s Chancellor . She demonstrated a keen interest in the history of Attilan and the possibility of there being additional Inhuman societies on Earth (a postulation that ultimately proved correct as shown in the Infinity Event). A crisis on The Moon led the council to conclude that all of Attilan was doomed. Cravenly, the council fled from Attilan with the Terrigen Crystals and relocated to the recently reemerged continent of Atlantis – hoping to reestablish a new Inhuman society on Atlantis. Fortunately, the Fantastic Four were able to intercede and save Attilan. Sapphiras and the other members of the council perished when Atlantis sank back down to the ocean floor. A latent Inhuman who was encased in a Terrgenic cocoon following exposure to the Terrigen Cloud. Mr. Schlickeisen had been Spider-Girl’s (Anya Corazon) social studies teacher in school and his unhatched cocoon was stolen by the renegade science coven known as AIM. AIM ultimately sold the cocoon to Dr. June Covington, the super villain also known as Toxie Doxie. Spider-Girl and members of The Avengers ultimately succeeded in tracking Covington down, defeating her, and saving Mr. Schlickeisen. Covington had preformed procedures on Schlickeisen, isolating his specific Inhuman DNA, extracting it, and transferring it to herself, effectively imbuing herself with his Inhuman powers. This power entailed the ability to be invisible to any and all forms of electronic detection. For instance, The Avenger, Iron Man, was unable to see Schlickeisen in that he was invisible to Iron man’s digital readout. Spider-Girl and her Avenger colleagues were ultimately able to save Mr. Schlickeisen and defeat Dr. Covington and her forces. It remains unknown it Mr. Schlickeisen maintained any of his Inhuman gifts or attributes and his current status and whereabouts have been thus far unrevealed. The Seeker was a title brandished by selected citizens of Old Attilan; those who were tasked with searching out and retrieving Inhumans who had ventured beyond the confines of Attilan. A new Seeker is chosen during their childhood with each successive generation. The most noteworthy Seeker was Kaldec, a cruel and ambitious Inhuman who was a devoted alley of Maximus the Mad. During one of Maximus’ more successful coups, Kaldec was commanded by Maximus to quell the disquiet among the labor party of Attilan. To this end, Kaldec imprisoned the leaders of the party and killed Korath (Gorgon’s father and the Inhuman dignitary who had acted as the labor party’s central advocate). Maximus was not sated by simply taking his brother’s crown, he also coveted his brother’s fiancé, Madam Medusa. Medusa had vanished during Maximus’ coup and Kaldec The Seeker was charged with locating her and bringing her back to Attilan. To assist him, Kaldec recruited his fellow Inhuman, Gorgon. Gorgon was loyal to the former King Black Bolt; furthermore, Kaldec had murdered Gorgon’s father, Korath. Yet Kaldec forced Gorgon to aid him, threatening to kill Gorgon’s mother, Milena, if he did not comply. Sending Gorgon ahead to reconnoiter, Kaldec traveled to the world of the humans accompanied by a platoon of soldiers. There he encountered The Fantastic Four and, following a short skirmish, The Fantastic Four, Medusa, Gorgon, and the rest of the royal family were all brought back to Attilan. With the Fantastic Four’s aid, Black Bolt was able to put down Maximus’ coup and the mad prince’s plans were dashed. During the action, Gorgon sought out Kaldec to extract vengeance for his murdered father. Kaldec and Gorgon battled one another and Kaldec was killed when a stone wall fell atop of him crushing his to death. Kaldec, like the Seekers who proceeded him, did not go through Terrigenesis. Instead he had trained in the use of a number of advanced and specialized weaponry. Primary among these weapons was the Universal Control Wand. The wand offered immediate control over a host of advanced technological devices used to capture his prey. Following his death, Kaldec’s twin brother, Uys, became the new Seeker. Uys, the twin brother of Kaldec, the Inhuman who had previously held the mantle of The Seeker. Uys was offered the title and position of his brother by Arcadius, the then chancellor of the Genetic Council. Arcadius tasked the Uys with finding Ahura, the son of Black Bolt and Medusa. Locating Ahura brought The Seeker into conflict with The Fantastic Four. Following a brief skirmish, Uys, Ahura and members of The Fantastic Four all returned to Attilan. There, Sue Storm was able to alert Black Bolt to a secret plot hatched by members of the Genetic Council and The Seeker to use Ahura’s powers in order to depose the king. Black Bolt put this would be coup down and Uys along with the seditious members of the council were all banished from Attilan into a shadow realm from which they have (to date) never returned. Like his brother, Uys did not go through Terrigenesis and instead relied on a bevy of advanced devices and weaponry, including the Universal Control Wand. Uys was also granted command over a group of Inhumans called The Burrowers, who acted as his minions in fulfilling his duties. Following Uys banishment it appears as though Black Bolt may have dissolved the role of The Seeker. A new Seeker was not assigned. The Inhuman telepath, Desidera, has acted as an Inhuman finder, but has not been specifically referred to as a ‘Seeker.’ Similarly, The NuHuman, Nur, has also acted as a finder, searching out the missing Inhuman children transported to places unknown via the door of Eldrac during the Infinity Event. Although he has acted in the role of Seeker, Nur has not been officially bestowed the title (although it is possible this will change under Medusa’s reign as queen). The current whereabouts of the universal control wand remains unknown. An Inhuman with purple skin, large bat-like wings, and a reptilian fin lining over his head and extending down into a long, barbed tail. Senschi acted as a messenger of the Royal court and the Genetic Council. When a group of young Inhumans were chosen to participate in an emissary program with the United States, Senschi was dispatched to fly about Attilan and inform each of these youths that they had been summoned to the Royal Palace. Senschi’s current status and whereabouts remain unknown. 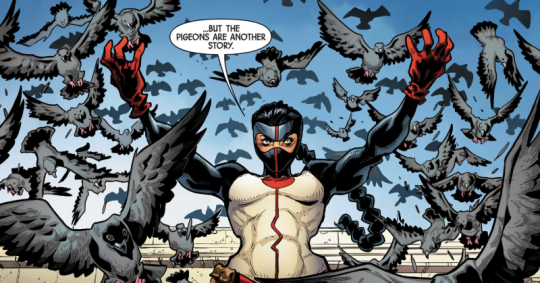 Leader of The Hidden Ones, a sub-sect of The Inhumans who had the ability to reshape their physical appearance as well as manipulate the psychological sense of will in others. Many decades back, a fluke in genetics somehow led to Terrigenesis creating a group of these shapeshifting Inhumans. It caused a good deal of alarm on Old Attilan and these changelings were looked at with much suspicion and disquiet. These changelings ultimately chose to leave Attilan to escape the escalating persecution and ventured off to create a small settlement not far from Attilan. These changelings came to call themselves ‘The Hidden Ones.’ They lived and thrived in their seclusion. Mating with each other produced offspring who possessed the same powers for psychical transformation and mental manipulation. The young Inhumans were trained to become spies and sleeper agents for the nazis. The war ended before Project Loki could be deployed, and the nazis were defeated by the Allied Forces. The Hidden Ones managed to escape in the chaos during the fall of Berlin. Senso, the oldest of the group was made their leader and she pledged that the Hidden Ones would never again be manipulated and used… that instead they would be the one’s pulling the strings, they would be the ones manipulating and controlling others. Senso and her fellow Hidden Ones managed to infiltrate their way into places of great power over the next few decades. Senso herself created the guise of high ranking general in the United States Military, navigating her way into a position of significant power and influence in the government. Later, Senso positioned herself so to have supervision over Reed Richard’s Stellar Shield program, an initiative meant to defend the earth against possible alien attacks. It was around this time that The Inhuman Royal Family had come to Earth following their involvement in a skirmish between the Kree and Shi’ar Empires. The alien known as Hunter Mister had been sent to Earth by the Shi’Ar to destroy Black Bolt and the others as retribution for a foiled assassination attempt on the Shi’Ar Magistrix. The Royal Family were able to fend off The Hunter Mister with the assistance of The Fantastic Four, but Senso was left highly concerned that all of this activity centering on the royal Inhumans might ultimately compromise the Hidden One’s identity and agenda. In an effort to prevent this, Senso and her colleagues began a campaign of anti alien sentiment, hoping that the paranoia over extra terrestrial threats would help keep the Hidden Ones’ identities a secret. Senso’s actions here proved to be folly in that it attracted the attention of Reed Richards. Richards, along with the Thing, went to investigate and this led to a battle between Senso and the two heroes. Richards and The Thing ultimately won out yet, before they could apprehend Senso, Richards received word that his wife, Sue Storm was going into labor. Richards and The Thing fled quickly to Susan’s side, allowing Senso to escape. In the aftermath, many officials within the government and military were fired, yet no trace of The Hidden Ones was ever found. What ultimately became of Senso and her fellow Hidden Ones remains untold. A new Inhuman whose transformation was triggered via exposure to the Terrigen Cloud. Terrigenesis imbued Serrata with razor sharp teeth as well as a pair of appendages prostrating from his lower forearms that look like long, serrated blades. These blade buzz with a vibration that allows them to cut through matter with great ease. Serrata was located by Lash and indoctrinated into his tribe of Orolan. The Inhuman took part in Lash’s attack on a Stark industrial factor in Switzerland. Following a battle with The Ultimates and the Inhumans of New Attilan, Serrata and his fellow tribe-members were teleported to the Triskelion where they were apprehended. A latent Inhuman who was transformed after exposure to the Terrigen Cloud. Sheath’s physical appearance was altered and her skin took on a pale shade of yellow while her hair turned bright green. It is as of yet unclear what powers Terigenesis has endowed unto Sheath, but it’s likely something to do with knives. Sheath was recruited by Lash and she currently resides with Lash’s tribe on Orollan. Ivam Guerrero, a new Inhuman whose transformation was caused by exposure to the Terrigen Cloud. Prior to Terrigenesis, Ivan had been a construction worker suffering from terminal lung cancer. Having battled this illness for a long while, Ivan had come to terms with his eventual death and was ready to let go. It was then that the Terrigen Cloud came over the his home and his body, along with those of his two grandchildren were encased in Terrigeneic cocoons. Terrigenesis cured Ivan of his cancer and endowed him with the ability to commune with and control the natural flora of earth (plants, spores and fungal lifeforms). Through this connection with the flora of Earth, Ivan could feel the planet’s pain; how it was suffering from environmental pollutants, the deterioration of the ozone layer, and overall global warming. Ivan was able to experience the planet’s peril and it felt no different then his own battle against cancer. He decided he needed to act in the Earth’s defense. Re-dubbing himself ‘The Shredded Man,’ Ivan began a campaign to re-terraform the earth, execrating the growth and development of the natural flora so to reclaim spaces that had been heavily industrialized. The Shredded Man began this in the city of Philadelphia, transforming a large swath of the downtown neighborhood into a mutated swamp of bizarre looking trees, vines, bog, and fungal-based creatures. These actions caught the attention of the Uncanny Avengers who interceded to save the various civilians caught up in The Shredded Man’s actions. These heroes were overwhelmed by The Shredded Man, with his synchronized control of the animated vegetation, man-eating plants, and dog-like creatures made of moss and bark. During the skirmish, the new Inhuman recruit among the Avengers, the young woman known as Synapse discovered that the Shredded Man was actually her grandfather, Ivan. Seeing his granddaughter again briefly brought Ivan back to his senses, but it was only a fleeting moment, and he quickly returned to his crusade to re-terraform the earth. Outmatched by The Shredded Man’s powers, The Avengers had to flee. Meanwhile, The time-traveler known hero known as Cable had journey back from a distant future. The specific future Cable had traveled from was a future in which The Shredded Man had succeeded in goal and dominated the planet. This earth was environmentally healthy, though chaotic and all but completely inhospitable to human life. Cable had come back in time so to prevent The Shredded Man from initiating the process that would bring this future to pass. To this end, Cable teamed up with The Uncanny Avengers and provided them advanced medical inoculations that would protect from the various venoms and spores of The Shredded Man’s mutated vegetation. Following a fierce battle, The Avengers ultimately prevailed. Heartbroken and desperate, Synapse felt it was her obligation to kill her grandfather and put an end to the threat The Shredded Man represented. Cable stopped her. He explained that The Shredded Man’s death is actually the action that caused the mutated flora to grown out of control, ultimately covering the entire globe. The Shredded Man escaped, promising to return once more to threaten the industrialized world. His current whereabouts remain unknown. A goblin-like Inhuman with red skin, sharpened fangs and a set of devilish horns. Snarkle was a criminal who lived on Attilan some two thousand years back. He was charged by King Kaldan and sentenced into exile in a limbo-like parallel dimension accessible through a portal projector. Many years later, the two new Inhumans, Iso and Flint, accidentally activated this projector, allowing Snarkle to escape. Fortunately, Iso and Flint were able to work together to subdue Snarkle and he was re-incarcerated in one of New Attilan’s more traditional cells. Elena “Yo-Yo Rodriguez. In Inhuman from the Marvel Cinematic Universe who has appeared in the television show, Agents of Shield. Elena is a Colombian citizen who underwent Terrigenesis during the Inhuman Outbreak caused by traces of Terrigen making it into fish oil supplements. Terrigenesis did not affect her physical form and she was endowed with the ability to move at supersonic speed. The nature of her super speed powers entail that she can move so fast to appear to the naked eye as instantaneous, yet she can only maintain such speed within a single heartbeat and she must always return back where she had initiated the power. A deeply spiritual person, Rodriguez had initially believed that her newfound powers were a gift from God; a gift that she used to fight against the corrupt elements within the Colombian governmental system. This briefly put her into conflict with the Agents of Shield, but the agents quickly realized Elena was using her powers for good. Elena was recruited her into the Secret Warriors program. Seeking to use her gifts to protect the world, Elena assisted in the battle against Hive, during which she was nearly killed while saving Alphonso Mackenzie from the attacking Primitives. Elena currently resides in Los Angeles and has been smuggling bone healing medication for her fellow Inhuman, Daisy Johnson, while Johnson is on the lamb. Elena is portrayed by actress, Natalia Cordova-Buckley. There is a 616 Universe analog for Elena who possesses the same powers although it remains unknown if this version of Elena is an Inhuman or if she gained her powers from a different source. An Inhuman with yellowish skin and two blunted, horn-like protrusions extending from his forehead. Spin had acted as the chief technology officer of the Ennilux Corporation and later assumed to the position of temporary chief executive officer when the corporation’s former leader, The Capo, was seemingly killed. Spin negotiated a tenuous peace with The Inhumans of NewAttilan. Some time later a summit for the shareholders of Ennilux was held at The Quiet Room in New York where a new CEO was to be elected. Spin was quite hopeful that his navigation of a peace treaty with New Attilan would assure him victory in this election. To further enhance his chances of maintaining his position, Spin arranged for the unveiling of a new chemical compound called ‘Antigen.’ This Antigen could temporarily nullify the effects of Terrigenesis in any Inhuman. With the growing number of new Inhumans all over the world, Spin was certain that the production of Antigen for consumer purchase would net the corporation huge profits. Before Spin could unveil the Antigen, however, the prototype was stolen by the super thief known as Fantomelle. Fantomelle had been contracted to steel the prototype by The Capo as part of a plot to undermine the peace with New Attilan and regain his position of leadership over Ennilux. In that this theft had occurred in The Quiet Room, Black Bolt was held as responsible and he dispatched a team to locate the stolen prototype. This team, led by Frank McGee, was ultimately able to track down The Capo and rebooting the prototype. The Capo himself was later killed by Reader. McGee returned the prototype in time for Spin to present it to the board of shareholders. Unfortunately, while Spin was busy fretting over the theft, young Ahura Boltagon worked over the various shareholders, using his charm (and possibly his psychic powers) to convince the various shareholders that he was best suited to run Ennilux. Much to Marishi Spin’s dismay, Ahura was elected the new chief executive officer of Ennilux. It is assumed that Spin has stayed on and continues to act as the corporation’s chief technology officer. A young new Inhuman named Jian who went through Terrigenesis following exposure to the Terrigen Cloud. Jian gained enhanced speed, strength and durability as well as the ability to psychically communicate with and control any kind of animal life. Jian’s powers led to his being recruited into the People’s Defense Force, the governmentally sanctioned superhero team of China. Jian took the code name ‘Spirit Animal’ (although this may be just an approximation of the codename when translated from Mandarin). In a mission with the People Defense Force, Spirit Animal and his colleagues traveled to a rural area to expel both Spider-Man and Crystal’s ambassadorial team who had come to study one of the Sky Spears. What began as peaceful mission escalated when The Collective Man tried to use his augmented strength to uproot the Sky Spear. The Spear’s internal defense mechanism sent out an electrical beam that struck both Crystal and Spirit Animal. The beam took over both of the Inhumans and forced them to attack the others. Spider-Man and Grid were able to free both Spirit Animal and Crystal by utilizing a jerry-rigged defibrillator to break the Spear’s control. Spirit Animal’s current status is unknown but it is assumed that he continues to act as a member of the People’s Defense Force. An Inhuman with a lithe frame, gray skin, and an enlarged cranium. He possesses the ability to create projectile orbs of a black ink-like substance. Contact with these orbs induces sleep or distracting, hallucinatory visions. Somnus is able to fire off these orbs with great speed and accuracy, making him a formidable combatant. Somnus was a member of the Royal Guard and took part in a strike force that attempted to fend off The Mighty Avengers during the Silent War event. He struck the Avenger, Ares, with one of his orbs, causing Ares to hallucinate a massive pool of blood from all of his past victims. While he was able to take out Ares, Somnus quickly thereafter knocked unconscious by one of The Wasp’s stun blasts. Somnus’ current status and whereabouts following the fall of Attilan during the Infinity event remain unknown. A latent Inhuman whose transformation and abilities were triggered by exposure to the Terrigenic Cloud. Spark’s powers enable him to generate an electrical fire that he can control and manipulate into energy blasts. Spark was one of the new Inhumans recruited by Lash and brought to Orolann. Spark and a small group of NuHumans were coerced by their colleague, Hollow, to travel to New York and abduct the young heroes, Haechi and Sun Girl of the New Warriors. Hollow’s intentions were to offer Haechi to Lash as a new recruit and in so doing win a place of greater status and power within Lash’s tribe. Hallow ordered his minions to kill Sun Girl, but Haechi was able to absorb Spark’s energy bolt and become empowered, facilitating his and Sun Girl’s escape. Lash arrived and was displeased by Hallow’s actions. He killed Hallow as punishment for his showing weakness. He then brought Spark and the others back to Oralann. Presumedly, Spark still resides there. An Inhuman with yellowish-green skin and minimalistic, somewhat stone-like features. Terriegensis imbued Sporr with the ability to create duplicates of himself by way of binary fission. He can spawn multiple clones, each of which maintains a hive-like singular sentience. Creating too many such clones, however, stretches Sporr’s constitution too thin, weakens him, and if stretched further can result in his death. Terrigene experimented on Sporr, hoping to unlock the Inhuman powers of Terrigenesis. While being subjected to this experimentation, Sporr managed to create a duplicate clone who escaped and went out in search of help. The Inhuman, Crystal was at the time a member of the Avengers, residing at Avengers Mansion. Sporr’s clone sought her out and led her to Terrigene’s lab. Through her experiments, Terrigene managed to unlock inhuman powers in herself, bestowing her the ability to fly and project energy blasts. When the Avenger arrived, Crystal and Terrigene engaged in a tremendous battle. Sporr managed to escape and he generated numerous clones to assist Crystal. Crystal ultimately defeated Terrigene, yet the process of spawning so many clones proved too taxing for Sporr and he perished. Afterwards, Crystal brought together two of Sporr’s clones and used her elemental powers to fuse the clones together. This somehow caused Sporr to revive. Having saved his life, Crystal accompanied Sporr back to Attilan. Sporr’s current status and whereabouts are unknown. Stallior is an Inhuman whose physical form is essentially that of a centaur (with the lower body of a horse and head and upper torso of a human). There has been numerous centaur-like Inhumans in Stallor’s lineage, suggesting that there is a quality in his family genome that predisposes Terrigenesis to create centaurs. Members of Stallior’s family have served as high ranking members of the Royal Guard for generations. Stallior was no different and he ultimately rose through the ranks to become the captain and chief commander of Attilan’s security forces. Stallior allied himself with Maximus in one of the mad prince’s many attempts at a coup to overthrow his brother and take the throne for himself. This coup ultimately failed and Stallior along with the rest of Maximus’ allies were banished from Attilan. Over time, it came to be understood that Maximus had used his mental abilities to manipulate the wills of those who served him. Stallior was eventually exonerated for his crimes against the state under the pretense that he had been manipulated by Maximus’s psychic abilities. Stallior was able to return to Attilan and even reattained his position of commander of the Royal Security Force. Some time thereafter, Stallior once again allied himself with Maximus in yet another bid to depose Black Bolt and take the throne. While it is possible that Stallior was again psychically manipulated by Maximus, he was not given the benefit of the doubt this time. Maximus’s coup was ultimately put down and in its wake Stallior was stripped of his rank in the security force. Stallior’s cousin, Avark, was instead named captain and it is assumed that Stallior continued to serve under Avark’s command. Stallior made a very brief appearance in the background of an issue of Uncanny Avengers where Synapse visited New Attilan. His appearance suggests Stallior had survived the fall of Old Attilan and new acts as a soldier in the reformed Royal Guard. An Inhuman with a diminutive statue, red skin, and a large bulbous head. A second pair of green, jewel-like eyes protrudes from the middle of his elongated forehead. Terrigenesis has endowed Sterlion with telepathic powers and the ability to read the minds of others. Following the Infinity Event and the establishment of New Attilan, Sterilon has acted as an advisor to Queen Medusa and the official telepath of the Royal Court. Sterilon was brought in to read the mind of Lineage, despite Lineage’s boasts that attempting to do so could prove fatal. Not willing to risk Sterilon’s safety, Medusa ordered the telepath to stand down. Whether or not Sterilon could have succeeded in discerning Lineage’s secrets or if the attempt would have indeed proven disastrous remain unknown. A version of Sterilon also appeared in the alternate reality of Battleworld during he Attilan Rising story-line. Sterilon occupies a role in Medusa’s court that had formerly been held by the telepath, Veritus. This suggests that Veritus may have perished with he fall of Attilan. A latent Inhuman whose transformation was caused by exposure to the Terrigen Cloud. Terrigenesis endowed Swain with psychic powers that enables her to read and control the emotions of others. The transformation also left Swain with a reptilian-like tail.Following her transformation, Swain accepted the invitation of asylum of New Attilan. She was made the captain of the Royal Inhuman Vessel (or RIV), an enormous flying fortress that circumnavigates the globe following the Terrigen Cloud. Swain’s central role aboard the RIV is to use her empathic powers so to maintain the wellbeing of Hub, the new Inhuman who was transformed into a powerful dynamo of unlimited energy. Hub’s energies power the RIV, yet his transformation has caused him great pain and emotional duress. Swain has used her powers to help Hub feel in control of his anxiety and the process of powering The RIV acts to quell his pain. Swain is especially good natured and seems to be very excited over her new life as an Inhuman. She is very fond of the sense of aristocracy in the Royal Family of old Attilan. She enjoys referring to Crystal as ‘Princess Crystal’ even though the title is something that causes Crystal herself to bristle. Swain’s good nature aside, she has felt a great deal of trepidation over the prospect that she might be unconsciously manipulating the emotions of others. She is not sure that she possesses full control of her empathic abilities and the idea that she could be unintentionally manipulative is something that worries her terribly. This concern over unintentionally manipulating others has been especially difficult in terms of Swain’s romantic life. The notion that she could unconsciously ‘trick’ someone into reciprocating a romantic advance is something that she could just not live with. This worry may be further compounded by the fact that Swain identifies as a lesbian and she would only want to be with a woman if that woman truly wanted to be with her. Swain continues to captain the RIV and is likely to make appearances in the upcoming Inhumans versus X-Men cross-over event. An Inhuman guardsman who patrolled the parameter of Attilan when the city was located on the blue area of The Moon. The upper half of Sylk’s body appears human, whereas the lower half is snake-like, a coiling ribbon that enabled her great speed, striking power and the capacity to ensnarl opponents in a wrapping fashion. She was among the guards who encountered a group of Kree invaders who had disguised themselves as refugees seeking asylum on Attilan. These Kree attacked the guards and Sylk and her companions were overrun. Black Bolt and the Royal Family were ultimately able to defeat and repell these invaders and Sylk was shown afterwards, having survived her encounter with the attackers. This was Sylk’s sole appearance and her current status and whereabouts remain unknown. A former King of Attilan and Black Bolt’s paternal grandfather. Symack married Tanith and together they had two son, Agon and Korath. Agon went on to become the king whereas Korath declined the position as prince and chose instead to lead the laborers union. Agon married Rynda and had two sons, Black Bolt and Maximus. Korath, meanwhile, married Milena and had one son, Gorgon. Emily Guerrero. A latent Inhuman whose special powers were bestowed to her by way of exposure to the Terrigen Cloud. Terrigenesis has not altered Emily’s physical form and has endowed upon her the ability to access and control the neurological functioning of others. This control extends to other people as well as animals, anything with a standardized, mammalian neural-circulatory system. The upper limits, extent, and duration of this control remains to be scene. Synapse’s ability to connect with the neurology of others seems to offer her something of an empathic sixth sense. When the city of Boston was being laid siege by the Shredded Man, Synapse was able to feel it and warn the rest of the Avengers team that they needed to get to Boston. She can additionally use her abilities to alter the biochemical functioning of others; as evidenced by her being able to bolster the immune system of a child sickened by The Shredded Man’s actions. Emily was recruited by Steve Rogers to join his Unity Squad of Avengers (re: the Uncanny Avengers). Although untested and still learning to control her powers, Rogers very much wanted Emily as a member of the team so that the squad could be viewed as embodying the interests of the Inhuman peoples along side humans and Mutants. Emily chose the codename ‘Synapse’ for her new life as an Avenger. One of her earliest missions with the team involved a battle against the Super Adaptoid. The Adaptiod being an artificial intelligence, Synapsed was unable to use her powers on him. Yet she quite cleverly used these powers to control a flock of pigeons. The swarming birds distracted the Adaptoid long enough for her fellow Avenger, Deadpool, to deliver the killing blow. Soon thereafter, Synapse and the Avengers arrived on the scene at Boston where the city was being taken over by the flora-controlling villain known as The Shredded Man. During the battle, Synapse discovered that The Shredded Man was actually her grandfather, who had also been transformed by the Terrigen Cloud. Emily’s grandfather had essentially raised her and it was absolutely distressing for her to find that he had been transformed into a super villain. The Shredded Man initially defeated the Uncanny Avengers. Aided by the time-traveling Mutant, Cable, The Uncanny Avengers took on The Shredded Man once more and this time they were victorious. The Shredded Man escaped and Emily has been left very concerned that her grandfather may resurface to again threaten the safety of the planet. Following this highly emotional mission, Synapse was sought out by Queen Medusa of New Attilan. Emily expressed a good deal of anger toward Medusa and the original Inhumans, feeling as though Terrigenesis was forced upon her and her family. She additionally berated Medusa over how the Terrigen Cloud has so deleteriously effected Mutants. Although unwilling to make excuses over the matter, Medusa pledged that Emily would always have a home among the Inhumans of New Attilan were she to ever wish it; and that New Attilan would be available to offer assistance were the threat posed by her grandfather to ever return (as well as if something similar were to occur with Emily’s brother). After a brief leave of absence, Emily rejoined the Uncanny Avengers. Cable has remained with the squad and has taken special interest in Emily, helping her to further refine her powers. With his guidance, Synapse has learned to utilize her power-set to be able to discern if someone is telling the truth or is lying, and even force another to tell the truth against their will. Though Emily is by no means responsible for the effects of the Terrigen Cloud on Mutants, her teammate, Rogue, has nonetheless remained cold and standoffish toward her. Rogue is suffering from Terrigen poisoning and Emily’s simply being an Inhuman is reason enough for her to feel animosity toward her. Synapse remains a member of the Uncanny Avengers team. She has thus far shown no allegiance to the Inhumans of New Attilan. Yet preview images for the upcoming Inhumans versus X-Men appear to indicate that Synapse may ultimately side with her fellow Inhumans during the conflict. The matter remains to be seen.